Our first two public performances of the year went very well. 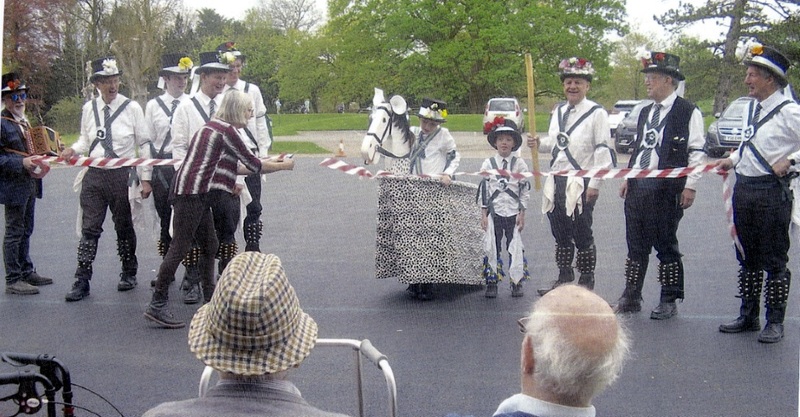 On Sunday 22nd April we danced in a beautiful rural setting on fresh tarmac at the Chacombe Care Home and took part in the official opening of their new car park (see the photo below). The residents, relatives and carers were very appreciative of the performances of the nine dancers present and particularly enjoyed the dancing of our two youngest dancers, Dylan and Theo. Theo, aged ten, only joined us at the start of the practice season, so it was his first public performance. Well done that man! 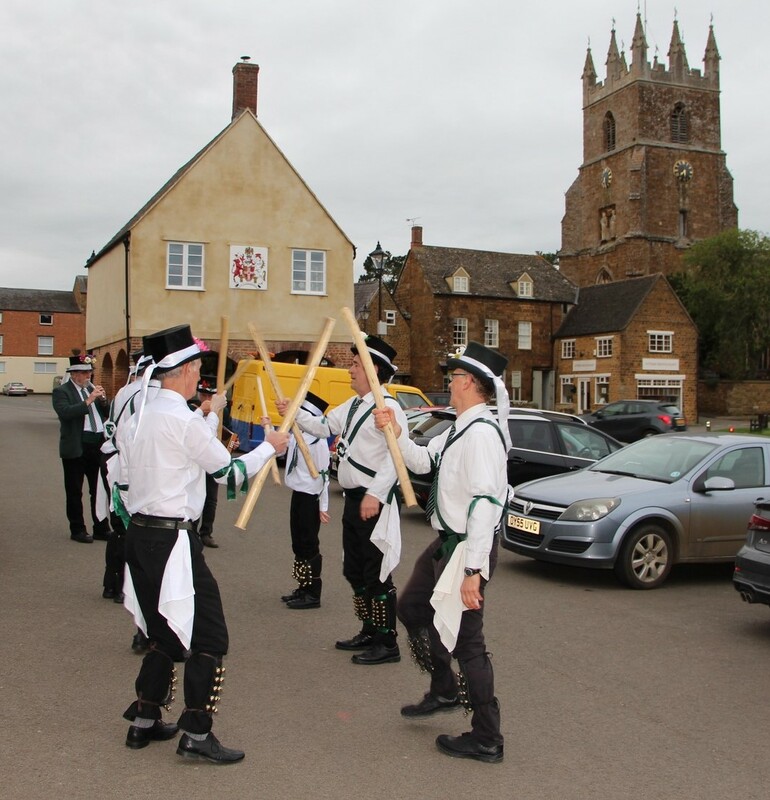 To celebrate St George’s Day on Monday evening 23rd April, we assembled a good team of ten dancers and two musicians to dance around Deddington. We started at The Unicorn where local vicar, Annie, gave us a special blessing and said a short prayer of thanks for the joys of Morris dance and friendship. On a chilly evening only a few hardy spectators braved the elements. However, the Landlord kindly offered us a free drink so we went inside and performed “Come Landlord Fill The Flowing Bowl” which was much appreciated by the man himself and his locals. Thanks to Dorset Dave and Donald for leading the singing on that item. We then proceeded to the Deddington Arms where we performed further dances from our repertoire before darkness descended and we called it a day. Earlier in the day a group of us had given a demonstration of Morris dancing to clients and carers at the Harborne Day Centre for adults with learning difficulties. A large and very exuberant crowd loved our performance and as always appreciated meeting Charlie the horse. The residents were taught a simple dance which they greatly enjoyed and they also showed us some disco dance routines which they had been learning for St George’s Day.